Traveling by plane costs an average of $370 per trip. And choosing the wrong airline has the potential to take even more from us. For instance, 24 animals died during air transportation in 2017, and four major U.S. airlines had at least one pet fatality. While critical to consider, such factors often fly under the radar due to our focus on price. But finding the cheapest airfare is now quite easy for anyone with an internet connection. So this report examines those other, overlooked aspects of air travel to help consumers make more informed decisions. 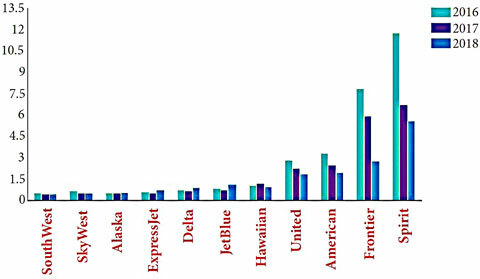 WalletHub compared the 9 largest U.S. airlines, plus two regional carriers, in 13 important categories. They range from cancellation and delay rates to baggage mishaps and in flight comfort. We also considered costs in relation to in flight amenities for the sake of fairness. For example, it wouldn’t be right to penalize an airline that charges for drinks if its tickets are far cheaper than those from an airline with free in flight refreshments. 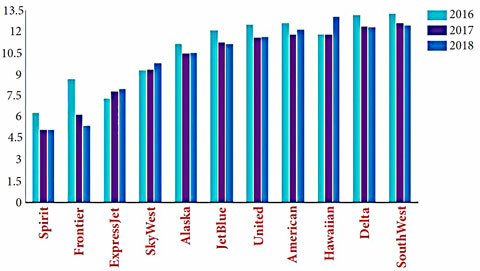 Most Reliable Airline … Delta Air Lines has the lowest rate of cancellations, delays, mishandled luggage and denied boardings. Most Comfortable Airline … JetBlue leads the pack in terms of in–flight experience, offering free amenities such as Wi–Fi, extra legroom, and complimentary snacks and beverages. * The regional carriers SkyWest and ExpressJet are not represented in the chart because they serve other major airlines, which may dictate what amenities are provided. 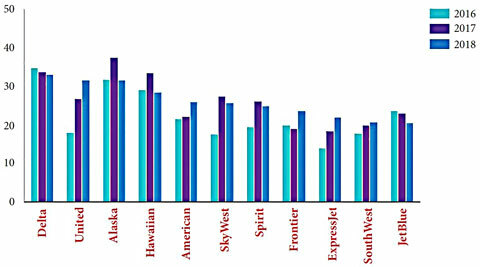 Cheapest Airline … Spirit and Frontier are the best airlines for budget flyers. *Reflects passenger revenue per available seat mile (PRASM),obtained by dividing passenger revenue by the product of the number of available seats, and the number of miles flown. Least Pet–Friendly … Nearly 1 in 10,000 animals died, got injured or were lost while transported by major U.S. airlines in 2017. None were incident free, but United and American had the highest incident rates. *Four major airlines do not transport animals: Frontier, JetBlue, Southwest, and Spirit. 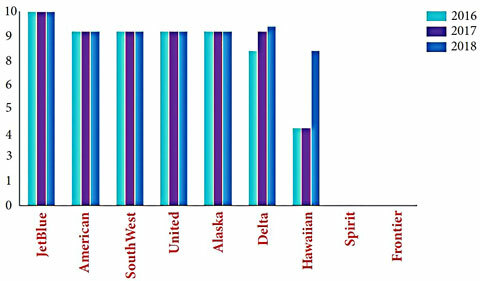 Most Satisfactory Airline … Southwest Airlines had the industry’s lowest consumer–complaint rate in 2017, while Frontier and Spirit had the highest complaint rates by far. 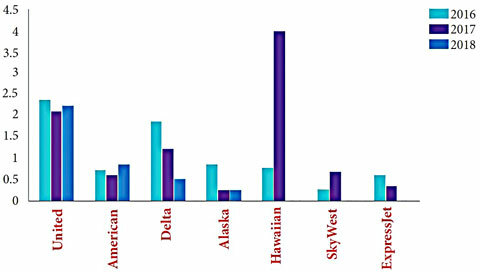 (1) Regional airlines that serve other major airlines. There are more regional carriers serving the national airlines, but these are the only ones required to report to the DOT. (2) As a regional airline, ExpressJet does not control baggage handling or bookings. These are handled by the main airline served. (3) Depending on the major airline served, flights from this airline may or may not provide the service. (4) There may be discrepancies caused by variations in how airlines code the delay data that they report to the DOT.